Another of my post-Christmas purchases. 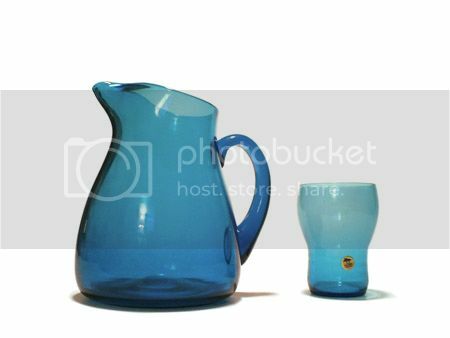 Edit: I've just noticed the tumbler and the pitcher look to be different shades of blue in the photograph - but in reality they are the same. If I am correct that John Orwar Lake was the designer, then the label dates from 1953 until 1976 when Ekenas closed. The quality of your piece seems better than mine, though. The rims of all the glasses (I have a full set of 6, but only photographed 1 of them for simplicity) are quite coarse. They're not chipped or fleabitten, just a little uneven to the touch. My piece is extremely well made and finished. Maybe they had different lines with different quality/finish depending if it was a "designer" piece :? Good luck finding information on your set. 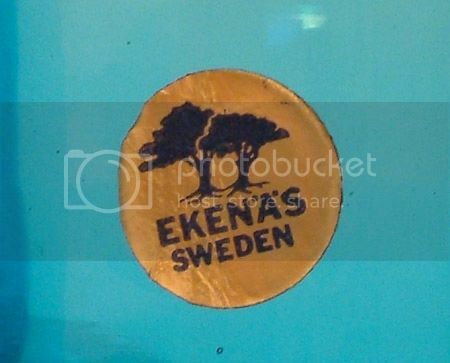 I could find scant info on Ekenas. Oh, apparently Michael Bang (of Holmegaard fame) worked for a while at EkenÃ¤s Glasbruk. Apparently it is where he gave up on his ceramics background and decided to focus instead on designing glass. Pina says he worked there "briefly during the 1960's". The other long serving designer was Greta Runeborg-Tell who left sometime in the 50s - no definite date given in Bill's book. Lovely buy - fab. colour! John Orwar Lake was also a designer for Ekenas but not sure of dates. My son has a signed piece.